Sakura, situated on Albert Road, was established in 2009 and was the first Japanese restaurant in Portsmouth. Now, in 2017, it has became my new, favourite place to eat. 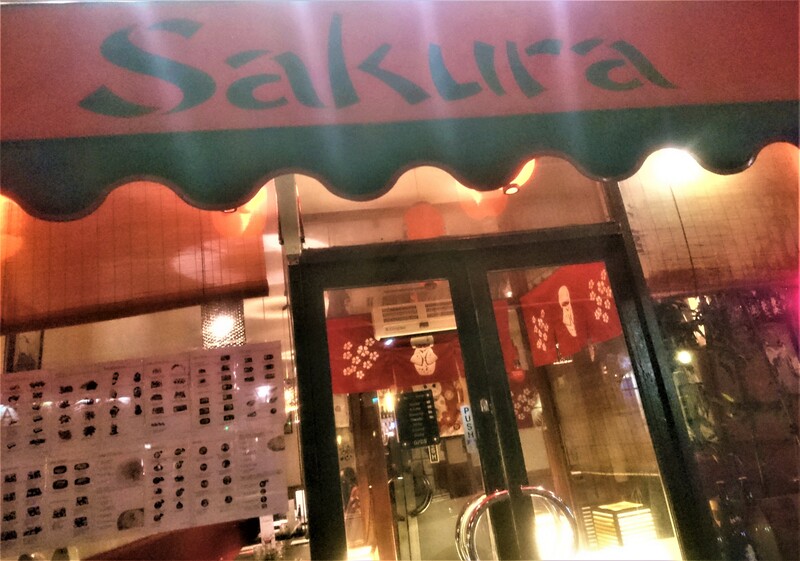 Open lunchtimes and evenings Monday to Thursday, and all day Friday to Sunday, Sakura is available for all occasions. Whether you want a light lunch or a wholesome dinner, this authentic Japanese restaurant seems to have it all. I have always wanted to eat in Sakura but for the past year, I have been ‘umming’ and ‘ahhing’ about whether to venture inside. The reason? I don’t like sushi and I always thought Sakura was just a sushi joint. On their windows, they have images of the various types of sushi they serve and nothing else. I always assumed that was all they did but I was wrong. So wrong. Sakura do a lot more than just fish rolled in sticky rice and seaweed. I visited on a busy Saturday night and although I hadn’t booked, the staff were very eager to accommodate me. They quickly found me a table, sat me down and gave me a menu. In 2013 I visited Japan, Tokyo to be precise, and fell in love. The culture, landscapes and food (definitely the food) stole my heart and ever since then I have been trying to find a close alternative. Yet, everywhere I go in the UK doesn’t quite cut it. Wagamama’s was poor in comparison and although Brighton’s Pom Poko came close, it wasn’t enough to give me butterflies. But, sitting in Sakura, I was hit by a wave of nostalgia. The blue flags, red lanterns, paper wall dividers, sake bottles and fortune cat statues made my heart flutter again. I could pretend to be back in Japan. 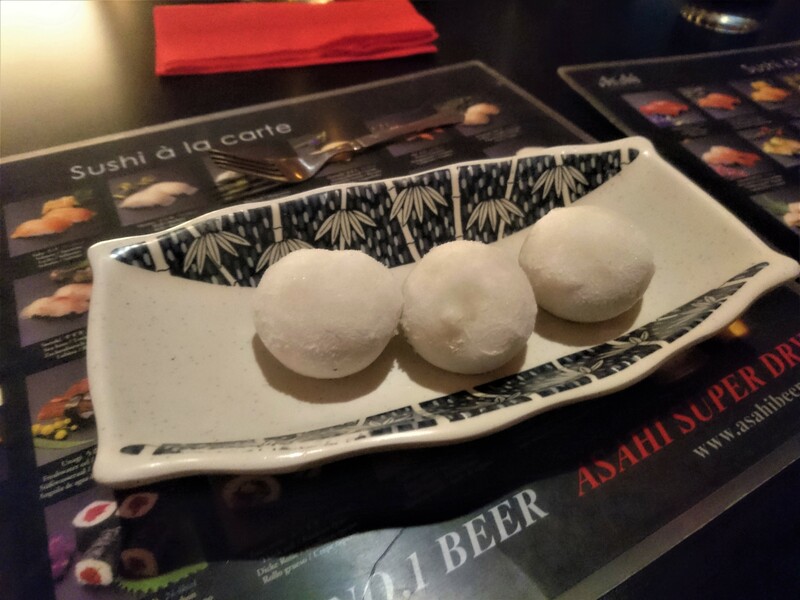 It goes without saying that Sakura is authentic, especially on the aesthetics and what about their food? They nailed that too. At first, it’s overwhelming, especially if you aren’t used to Japanese cuisine and not sure what to order. But, something stood out and solved this issue – teishoku meals or set meals. There are 11 variations of these and each one includes a form of meat such as sashimi or deep fried (katsu) pork, squid rings or dumplings, vegetable rolls, rice, salad, miso soup and pickles. These had a good mix of everything and having something similar in Japan, I knew they would be good. I ordered one and a glass of Takana plum wine. I didn’t have to wait long for my food but whilst I did I pondered the menu a little longer. I had two questions I wanted to ask. What on earth was the ‘hell ramen’? And, how was it all so cheap? Sushi varied around £4 each, depending on which you ordered, and the larger noodle dishes only cost £8 (roughly). 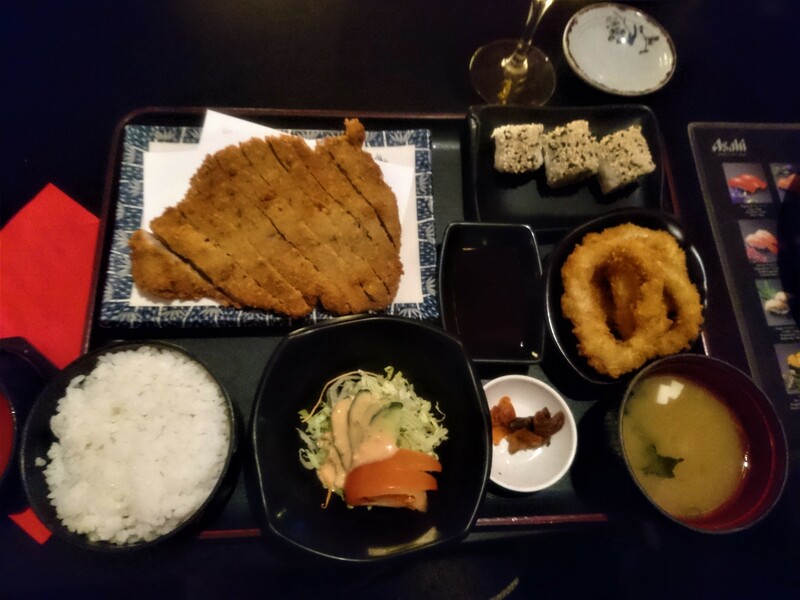 My teishoku meal was the most expensive on the menu at £13 but that was certainly worth it with how much is included. It was like a starter and main combined and looking around at the other people eating, the noodles and sushi were plenty too. My teishoku came as a large tray with compartments for each ‘thing’ and it was huge. On one side was a slab of fried pork and, on the other, a heap of rice, a medium-sized bowl of soup and three chunky sushi rolls. I already knew it would be too much but either way, I tackled it, chopsticks clumsily flailing in one hand. The salad was a small bowl of shredded lettuce with a chunk of tomato and some pink sauce I assumed to be Thousand Island. It wasn’t anything special but it was nice. The sushi or vegetable rolls had avocado and cucumber in the middle and although they didn’t take my fancy much, they were very refreshing and cleared my palate for the food ahead. The pork was cut into thin strips with a golden crispy coating. It was very moreish and tasted great with the mysterious pot of sauce given to me on the side. The best I can describe it is a soy and barbecue sauce hybrid. Tasty either way. The rice was piping hot and sticky. It was just like authentic Japanese rice and tasted almost sweet. I then went onto the small saucer of pickles. I took a bite, regretted it and then took a swig of my plum wine. I also regretted this. The drink, although sweet and tasty, had a thick texture like cough syrup. It was good to sip but taking a huge mouthful, in one go, as I did, is not advised. It’s a bit too rich for that. 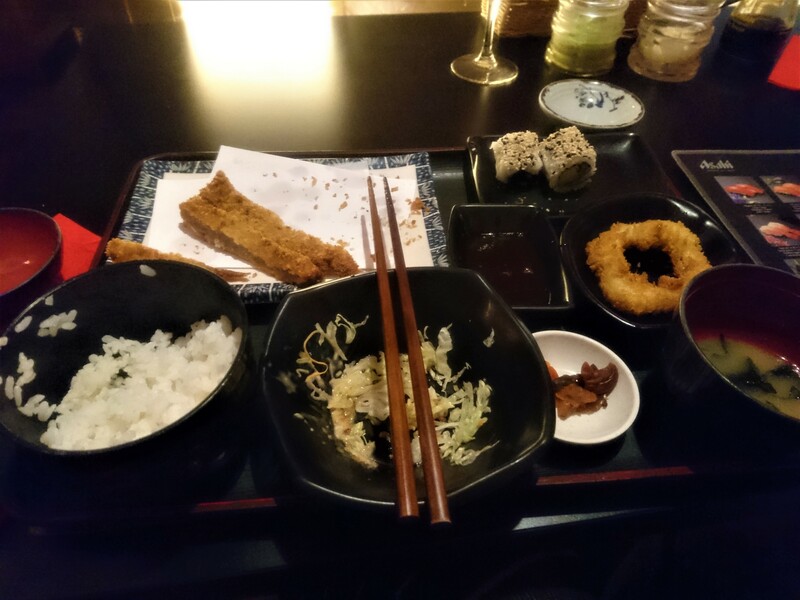 Left was the miso soup and three crispy squid rings. The squid although not having much flavour was chewy and hot and the battered outside was perfect. It was just right and not too greasy or heavy. At this point, I had to give up but there was still so much left on my plate. Patting my belly and slumping in my chair, I finished it off with the warm, brothy miso soup. Now, if you haven’t had miso soup before, be warned – it is a peculiar flavour. Not bad, just peculiar. It’s like a strong mix of fish and beef stock but it did finish the meal well, leaving me satisfied and warm. It took a while for the servers to clear my table. Although they were quick to bring it to me, they didn’t seem to notice that I was finished. The restaurant had gotten busy but not too busy so I couldn’t understand why they didn’t approach me sooner. Maybe I really had left that much food. I didn’t mind much as, when they did come over, they flashed me a big smile and asked if I wanted to take my food home. Appreciating their extra effort I said ‘yes’ and asked to see the desserts. About five minutes later, the waiter came over again, menu in one hand and a filled bag in the other. They had put each food item in a separate Tupperware box and even added some packets of sauce and ginger. I was very happy about this and ordered some vanilla ice cream mocchi. Content and happy I paid my bill which came to just over £20. The great value for money was the metaphorical cherry on top of the cake. I knew I would be back. Maybe next time I would try their range of sushi dishes or even the ‘hell ramen’. As if I would ever be so daring. Sakura is a sparkling gem in Southsea and is a prime example of why we must celebrate Portsmouth for its food, not just art and history. It is authentic, good value and very tasty. It’s something different amongst all the pubs and coffee shops on Albert Road and does itself and the city proud. I definitely recommend this restaurant to everyone, even those who aren’t very experimental. It can be daunting to try new cuisine but it is so worth it in Sakura’s case. I would say the only downside is the service as they can be quite slow but they do serve you with the utmost care and go the extra mile. Anyway, food this good is worth the wait.